I have been listening to Explosions in the Sky (EITS) since 2001, back in the early days of EvilSponge, when post-rock was a new phenomenon and EITS were one band of many doing pretty much the same thing. It's been 15 years now, which is a long time and The Wilderness is the fifth album by the band that i own, but it is only the second that i have reviewed. They are one of the bands in this genre that i keep coming back to. I think that they continue to push the boundaries of post-rock, to do new and interesting things with instrumental guitar-based music that ebbs and flows. And The Wilderness is the best thing they have ever done. On The Wilderness EITS have created a really epic record that moves in strange waves of sound. 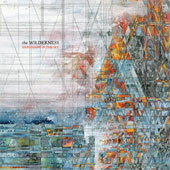 The album starts off with title track Wilderness, kicking the whole thing off with faint noodling sounds, like the song is built up slowly from bare component materials -- a guitar riff lingering, a drum tap, some wavering noise. They build it slowly into a grooving rock tune that never gets too dense, but instead flows in understated epicness. It flows right into The Ecstatics which has a similar sort of drum riff but becomes really catchy, a piano tinkling while the drums roll. Just beautiful. Tangle Formations is driven be a monotonous riff, drummer Chris Hrasky pounding a steady beat that drives dueling guitars along. They add in some horns for a bit, and they the song sounds very slightly like something British Sea Power would do, only more distorted and echoing. The fourth track is stunningly beautiful. It's called Logic Of A Dream and begins with washes of synths flowing for about two minutes until Hrasky comes in with a killer riff, then guitars throb in, and a faint voice wanders by, echoed and singing wordlessly. The song throbs and thunders, energy barely constrained as for six minutes EITS pound it out. This song needs to be played loud! The guitars (and there are lots of them in the band) really shine on Disintegration Anxiety, layers of them sliding against each other, grinding and tinkling away. The interplay that goes on here is really beautiful. Losing The Light delicately pulses along, the whole song sort of throbbing like a heartbeat at first, until a piano and strings come in. This song meanders slowly for a while, a faint thing, often barely there. Here EITS approach ambient rock, and do it fairly well. Next we have Infinite Orbit which, at two and a half minutes, is really more of an interlude in post-rock terms. Hrasky pounds in and everyone slams at their guitars. This is the most by-the-numbers post rock tune on this album. The drum beat that drives it continues into Colors In Space which stretches out to a genre appropriate seven minutes. EITS combine tinkling guitar and spacey reverbing sounds to Hrasky's insistent drumming. The song parts to become very delicate and minimal in the middle, and so very pretty as faint layers of guitar tickle against each other before building back up to a thundering noise. This is a really stunning album. Wow.